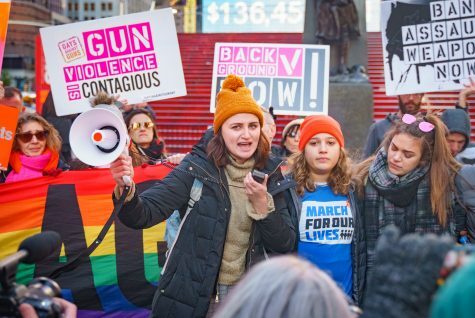 Dozens of people gathered in Times Square on Sunday afternoon to celebrate the lives of the 12 people killed in the mass shooting in Thousand Oaks, California, on Wednesday and to call for gun control reform moving forward. 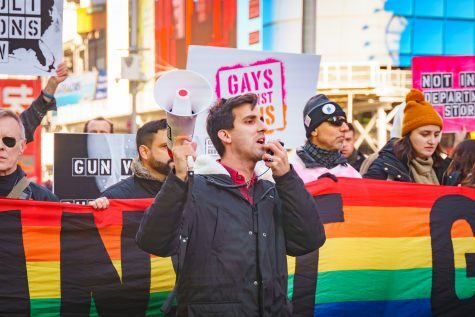 Over 30 people gathered in Times Square on Sunday afternoon, holding up a long rainbow flag, billowing in the wind, with the words “Gays Against Guns” printed on it. 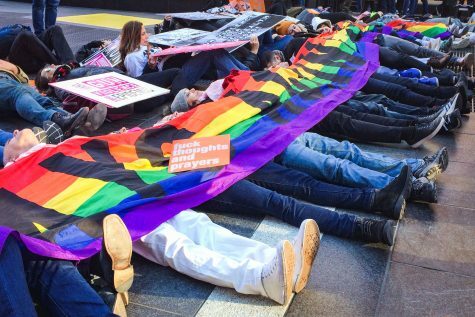 No more than 50 feet from the base of the red stairs between West 46th and 47th Streets, members of Gays Against Guns, a group formed in 2016 after the Pulse nightclub shooting in Orlando, chanted, “Trump, Congress, NRA, 100 people dead each day,” referencing the 96 people who die every day from gun violence in the United States. 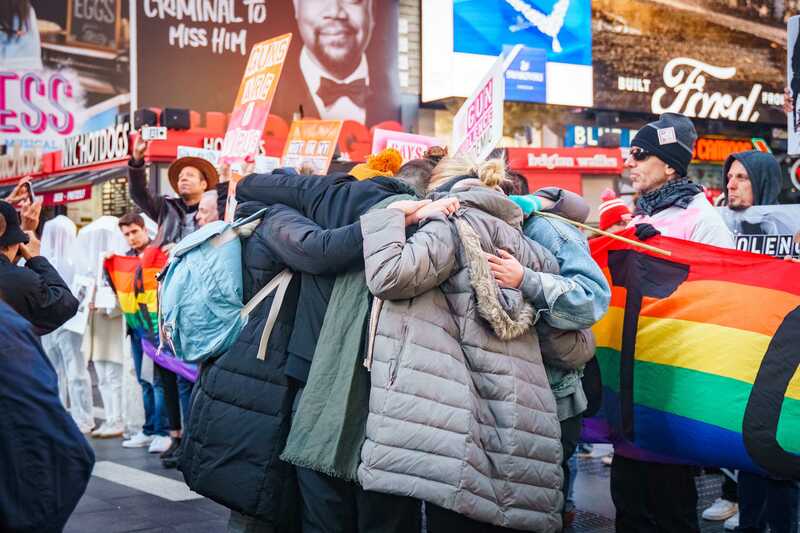 The group had gathered at the U.S. Army Recruiting Center on West 43rd Street and marched a few blocks north to Father Duffy Square with a purpose. They were there to celebrate the lives of the 12 people killed when a gunman opened fire at Borderline Bar & Grill in Thousand Oaks, California, on Wednesday, and to push for gun control reform. For Kylie Vincent, who served as co-director of March for Our Lives in Manhattan, the shooting was personal. Vincent hails from Thousand Oaks. 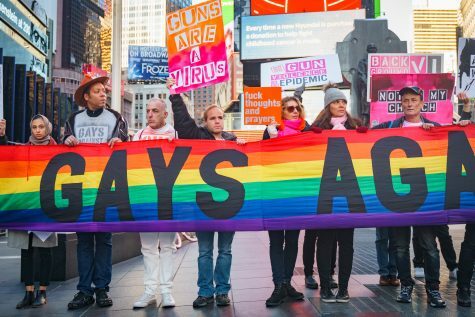 Gays Against Guns supports common-sense gun control, which calls for measures such as bans on assault weapons, universal background checks and closing what is known as the “gun show loophole,” in which most states do not require background checks for the sales of firearms at gun shows. 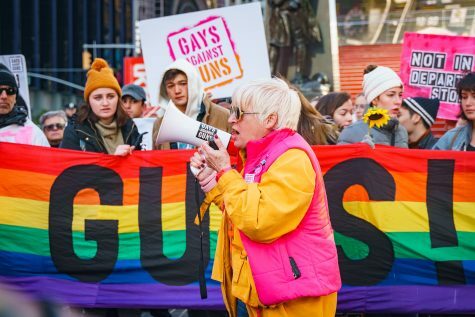 Ken Kidd, an original member of Gays Against Guns and the director of Special Projects and Events in the Office of the Dean in CAS, was another one of several activists who spoke at the rally. Kidd traced the gun violence epidemic back to many politicians’ habits of accepting money from the National Rifle Association. Tisch junior Jeff Lawless, who attended the rally, lives in Southern California and went to the Borderline when he spent time in Thousand Oaks this summer. The rally coincided with Veterans Day, so it bore special significance for Marti Gould Cummings, a member of Hell’s Kitchen Democrats and the Mayor’s Nightlife Advisory Council. As the rally drew to a close, people read the names of those killed on Wednesday as 12 people, intended to represent these victims, lined up in front of the flag. 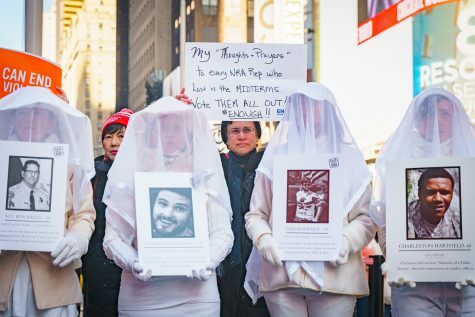 The dozen were dressed in white clothing and veils, and each person bore a paper with a photo and short biography of one of the victims. Finally, the group of people clutching the flag laid on the ground, draping the fabric over themselves.